Founded in 2017, Helix Cognitive Computing GmbH is a Berlin-based technology company that is dedicated towards developing and creating a sustainable digital ecosystem that interconnects Everyone and Everything; without intermediaries or central authorities, and at virtually no cost. By creating a “blockless and chainless”, next-generation peer-to-peer digital exchange network, called the HelixTangle, and a Cognitive Cryptocurrency ‒ HLX, the company plans to engage and help shift existing economic and political power structures across all levels of industry and society. Regarding security, Helix is working on the first transaction ledger monitored by Cognitive Security. Data needs to be immutable, and Helix is developing a cognitive security engine to maintain the integrity of data interpretation. With data security being the key order of the day in 2018 and 2019, the fraud-resistant HelixPlatform will facilitate natively secure distributed app development. By creating a “blockless and chainless”, next-generation peer-to-peer digital exchange network, called the HelixTangle, and a Cognitive Cryptocurrency ‒ HLX, the company plans to engage and help shift existing economic and political power structures across all levels of industry and society. Regarding security, Helix is working on the first transaction ledger monitored by Cognitive Security. Data needs to be immutable, and Helix is developing a cognitive security engine to maintain the integrity of data interpretation. With data security being the key order of the day in 2018 and 2019, the fraud-resistant HelixPlatform will facilitate natively secure distributed app development. Helix focuses on easy accessibility, intuitive usability, system efficiency and the highest standard of security measures. It provides a Distributed Ledger that requires very little technical expertise nor delays commercial production by old-fashioned authentication processes. As a common payment method or trading currency, Helix can invigorate old workflows, and eliminate extraneous costs, which are typically felt by both producers and consumers. From a business point of view, Helix will incubate entirely new business models that combine the new machine and IoT economy with existing models. Furthermore, traditional businesses depending on third parties and intermediaries can be radically re-engineered through the use of the HelixTangle. The HelixPlatform facilitates peer-to-peer exchange through a value token represented by the acronym HLX. This modern and versatile cryptocurrency is used as the denomination for all value-transfer functions across the HelixEcosystem such as use cases. Helix aims to support ongoing efforts towards creating novel data storage systems, by promoting and incentivizing breakthrough inventions in synthetic biology research (e.g. DNA-based molecular storage systems). Team: really good team. They can do with some more advisors regarding blockchain. Vision: Vision is really good. They need to clearly put more information of what they want to achieve. Lots of things are industry specific. They need to tell clearly what they want to achieve. Product: There is no MVP yet. I will update the ratings when the MVP is ready. Helix Cognitive Computing GmbH was successfully established as a legal entity in Germany. 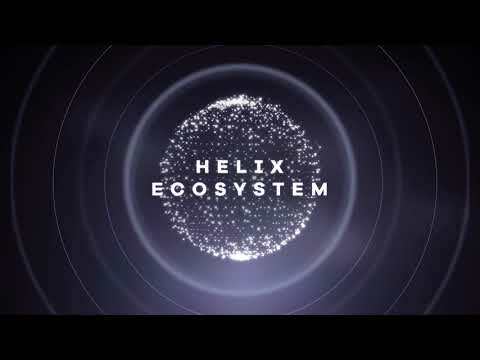 The HelixTangle utilizes Directed Acyclic Graphs as a DLT protocol for the Internet of the future. HLX Coins are not mined and originated as soon as the HelixTangle was initiated – a process known as Genesis. Simulation based testing of several candidate neural network architectures, both supervised and unsupervised machine learning models, is underway to deliver dynamic, adaptive network topology orchestration for peer nodes, and critical control functions for all participants in the HelixEcosystem. The Helix Whitepaper will be available for public viewing in July 2018. The Whitepaper can be accessed on www.hlx.ai and will be released alongside the FAQ and Lightpaper. Beta version of the HelixWallet is expected to launch by the end of the year. HLX coins will be listed on major exchange platforms for purchase. Helix will start developing a bio data platform called BEAMS.